Don’t know if the news this week can be called “seeing” a black hole but see what you think. (Prof Smartt) said the light “puzzled us for months” but based on their telescopic observations, the QUB team proposed a new explanation for the object in a galaxy far, far away. 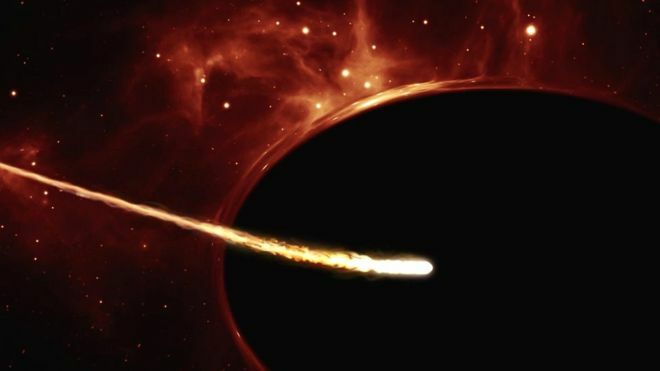 It believes the sun-like star wandered too close to the black hole and was “ripped apart”, a phenomenon known in astronomy as a “tidal disruption event”. In the process, the star was “spaghettified and some of the material was converted into huge amounts of radiated light,” said a QUB statement. International research is using new computer models and evidence from meteorites to show that a low-mass supernova triggered the formation of our solar system. A question was asked as to how small a star involved in a Low Mass Supernova is. If you want to read the paper the link is below. By investigating isotope abundance they showed that the problems of abundances in our sun created by the assumption that a large supernova (>15 Solar Masses) triggered collapse of the gas and dust cloud are removed if <12 solar mass core collapse super nova are modelled instead. Astronomers have identified what they believe to be the 2nd generation of stars, shedding light on the nature of the universe’s first stars. Date February 11th, 2016; Source Physical Review Letters, 116, 061102; Links : aLIGO/MIT : Institute of PhysicsOn the 8th February New Scientist reported that “Latest rumour of gravitational waves is probably true this time”3 days later, on the 11th Feb a paper entitled “Observation of Gravitational Waves from a Binary Black Hole Merger” was published by the members of the LIGO Scientific Collaboration and Virgo Collaboration. The waves were produced from the collision of two black holes of 36 and 29 solar masses, respectively, which merged to form a spinning, 62 solar mass black hole, some 1.3 billion lightyears (410 mpc) away in an event dubbed GW150914A question was asked at our meeting about signal times and frequencies, the diagram, below, gives more information. Date February 24th, 2016; Source NASA; Link : NASA : NANOGravGravitational waves span a wide range of frequencies that require different technologies to detect.A new study from the North American Nanohertz Observatory for Gravitational Waves (NANOGrav) has shown that low frequency gravitational waves could soon be detectable by existing radio telescopes. Date February 24th, 2016; Source Max Planck Institute for Radio Astronomy; Links : Science Daily : Subaru TelescopeAn international research team used a combination of radio and optical telescopes to identify the precise location of a fast radio burst (FRB) in a distant galaxy, allowing them to conduct a unique census of the universe’s matter content. Their result confirms current cosmological models of the distribution of matter in the universe. We live in a universe dominated by unseen matter, and on the largest scales, galaxies and everything they contain are concentrated into filaments that stretch around the edge of enormous voids. Thought to be almost empty until now, a group of astronomers based in Austria, Germany and the US now believe these dark holes could contain as much as 20% of the ‘normal’ matter in the cosmos and that galaxies make up only 1/500th of the volume of the universe. Date February 17th,2016; Source Lomonosov Moscow State University; Links : Science Daily : RASAnalyzing the data collected by the Fermi Gamma-ray Space Telescope Maxim Pshirkov (The Sternberg Astronomical Institute, MSU) discovered a new source that confirmed the fact that binary systems with strong colliding stellar winds comprise a separate new population of high-energy gamma-ray sources. This could be possible using a ‘photonic propulsion’ system, says NASA scientist Philip Lubin. A massive laser based on Earth would fire bursts of photons into the ‘sail’ of the spacecraft and accelerated it up to 26% the speed of light, which is unheard of in space flight. But that’s only for a tiny object with a 1 meter solar sail. Larger, more practical crafts, would be accelerated to between 1-3% the speed of light, which is still fantastic. In that moment of union, the holes radiate pure energy in the form of gravitational waves, and lose mass equivalent to three times that of our Sun. Energy equals mass times the speed of light, squared (E=mc2). Everyone knows the equation; this is it in action. Researchers from the LIGO collaboration who last week announced they had detected the first ever gravitational waves – spewed out from two merging black holes – have also picked up a second possible gravitational wave event. 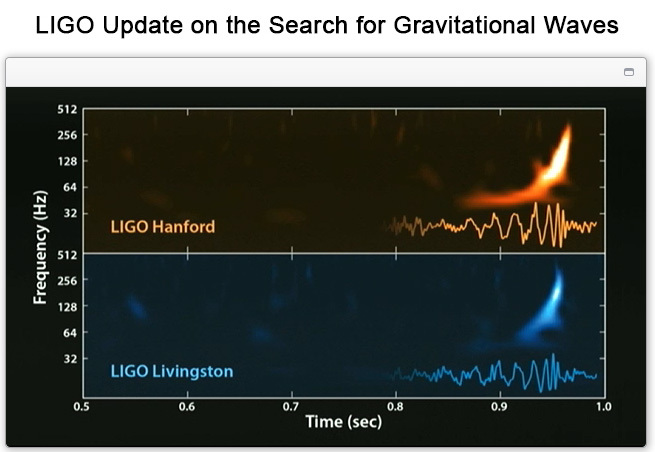 Although the signal from “LVT151012″ is much weaker than the confirmed “GW150914” event, the LIGO team says it most likely has an astrophysical source and arose from two coalescing black holes. The researchers have in addition spotted “several even less significant events in the data, most likely just due to some disturbance at the detectors”, which they are now analysing to see if any are from gravitational waves. Their conclusions, expected over the course of this year, will see the new era of gravitational wave astronomy finally start. Hot on the heels of last week’s monumental discovery of gravitational waves – made by researchers working on the Advanced Laser Interferometer Gravitational wave Observatory (aLIGO) in the US – India’s Union Cabinet has given its “in principle” approval for a similar observatory, dubbed LIGOIndia, to be built in the country. The project will be led by the Indian Initiative in Gravitationalwave Observations (IndIGO), which has been a member of the international LIGO collaboration since 2011 and contributed towards last week’s discovery. 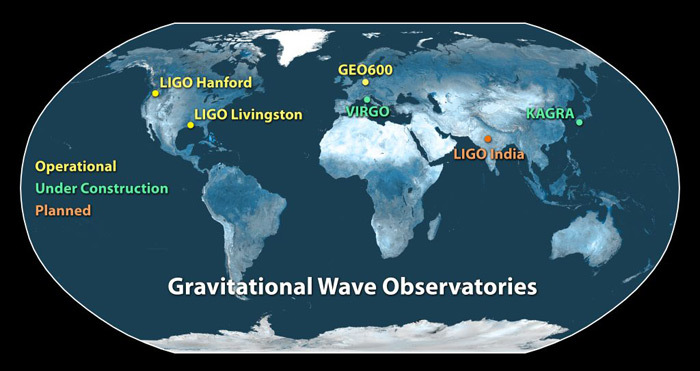 Once built, LIGOIndia will join the global network of LIGO observatories, which currently includes the US, Germany, Italy and Japan. China’s National Space Administration (CNSA) released hundreds of HD and never before seen images of the Moon. The Rover, known as “Jade Rabbit”, landed in December, 2013, near the crater Zi Wei in the Imbrium Basin. Astronomers indirectly spot neutrinos released just 1 second after the “birth” of the universe. The cosmic microwave background (CMB), 380,000 years after the big bang, is as far as we have been able to look back to date. Unfortunately this means that it obscures what lies beyond this boundary. Now astronomers think they have peeked beyond even the CMB by capturing evidence of neutrinos travelling since the cosmos was just a second old. Previous studies suggested that gamma rays coming from the dense region of space in the inner Milky Way galaxy could be caused when invisible dark matter particles collide. Using new statistical analysis methods, two research teams, at Princeton and in the Netherlands, have independently found that the gamma ray signals are uncharacteristic of those expected from dark matter. Many ancient civilizations made astronomical notes, but according to researchers, this is the earliest historical document of naked eye observations on a variable star – Algol, 90 ly distant in the Perseus constellation. Lauri Jetsu and Sebastian Porceddu, University of Helsinki, said: “Our statistical analysis leads us to argue that the mythological texts of the Cairo Calendar contain astrophysical information about Algol”.